The Derby Bosnia-Herzegovina Community Association was established in January 1995 and was registered as a Charity in 1998. Derby Refugee Forum was established in 2000, registered as a Charity later, and working from premises of Bosnian Community since. 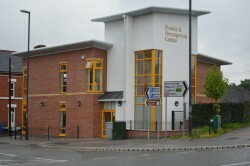 From year 2000 until 2009 we all have operated from former Bosnia-Herzegovina Community Centre on 1 Uttoxeter New Road which was officially opened on June 16th 2001, jointly by His Excellency the Ambassador of Bosnia-Herzegovina in London, Osman Topcagic, and the Mayor of Derby, Councillor Janet Till. From September 2009 until June 2013, the both organisations were operating from Gallery - Place of Welcome, delivering it's services to its clients group as a "One Stop Shop". In June 2013, the both organizations has moved to permanent place, it's own building Bosnia & Herzegovina Centre at 99 Curzon Street. The Centre was officially opened jointly by Ambassador of Bosnia Herzegovina in London, His Excellency Mustafa Mujezinovic and Mr. Adam Wilkinson, Chief Executive of Derby City Council. From the beginning the DBHCA has opened its services to the community, focusing it services on the people from Former Yugoslavia. Bosnia & Herzegovina Centre run by the executive committee of the Derby Bosnia-Herzegovina Community Association, is the only centre of this kind offering advice and information in the Bosnian/Serb/Croat language in the Derby City and East Midlands area. There are many services available to destitute asylum-seekers and refugees via Derby Refugee Forum and DRAC, including food parcels and clothing, help to small new community ethnic groups via ncise, and many other services offered from our "One Stop Shop" volunteers. We are also a member of the Bosnia-Herzegovina UK Network who operate nationally.